What Should You Look for in a Char Grill? Char Griller has been making various types of grills for several decades now, and they’ve already made a mark in the grilling community. Their grills always deliver great tasting dishes at a very affordable price. We’ve come up with this list of the top 10 Char Grillers out there, based on our own experience and research. We’ve tried out each of these grills ourselves, and compared our experience with the reviews and feedback of customers online. We evaluated the different types of grills Char Griller manufactures and analyzed them based on the features that one can find in a char grill. Here we came up with this top 10 list of Char Grills, and chose the best pick from each type of griller they have. This stainless steel grill is built to last. It has an electronic ignition as well as a side burner, making it easy to use, durable and also simple to move around your garden. Check It on Amazon ($279.86) Prices are accurate as of 24 Apr 2019 at 12:19 AM . Product Prices and availability are subject to change. Any price and availability information displayed on Amazon at the time of purchase will apply to the purchase of any products. Compared to all the gas grills of Char Grillers, the 3001 Grillin’ Pro 40 has 12 out the 27 features that we listed down for comparison. The best features we like are the porcelain-coated cooking grates, the side burner, stainless steel thermometer two wheels that make it so portable, and the electronic ignition. It is so easy to use, from ignition to temperature control. You can easily cook a complete meal with it, with minimal effort. It is priced under $200, making it affordable and well worth its value. This grill comes in at second place, as some customers reported a couple of issues. However, it is a great picnicking grill, that is really easy to take different places, because it is so portable. Check It on Amazon ($138.00) Prices are accurate as of 24 Apr 2019 at 12:19 AM . Product Prices and availability are subject to change. Any price and availability information displayed on Amazon at the time of purchase will apply to the purchase of any products. This kamado grill beats all others from Char Grillers in terms of features and performance. Out of the 27 features we used for comparison, it has 14, including the ash pan at the bottom for easy ash disposal, portable build and weight, and precision temperature control with its two air dampers and heat gauge. Best of all, it is very compact and portable, and comes with handles. It’s the perfect grill for small outdoor parties, camping, and picnics at the park. This grill uses heavy duty steel and a cast iron grill, so it is built to last. There are some issues with wobbles and assembly, but overall it is a great grill that is nice and compact. Check It on Amazon ($90.00) Prices are accurate as of 24 Apr 2019 at 12:19 AM . Product Prices and availability are subject to change. Any price and availability information displayed on Amazon at the time of purchase will apply to the purchase of any products. 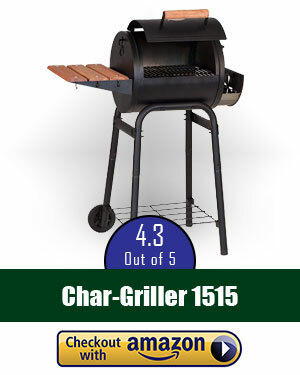 If space is a challenge but you want to enjoy grilling your meat, this Patio Pro 1515 is your best bet. It’s the perfect space-saving Char Griller. 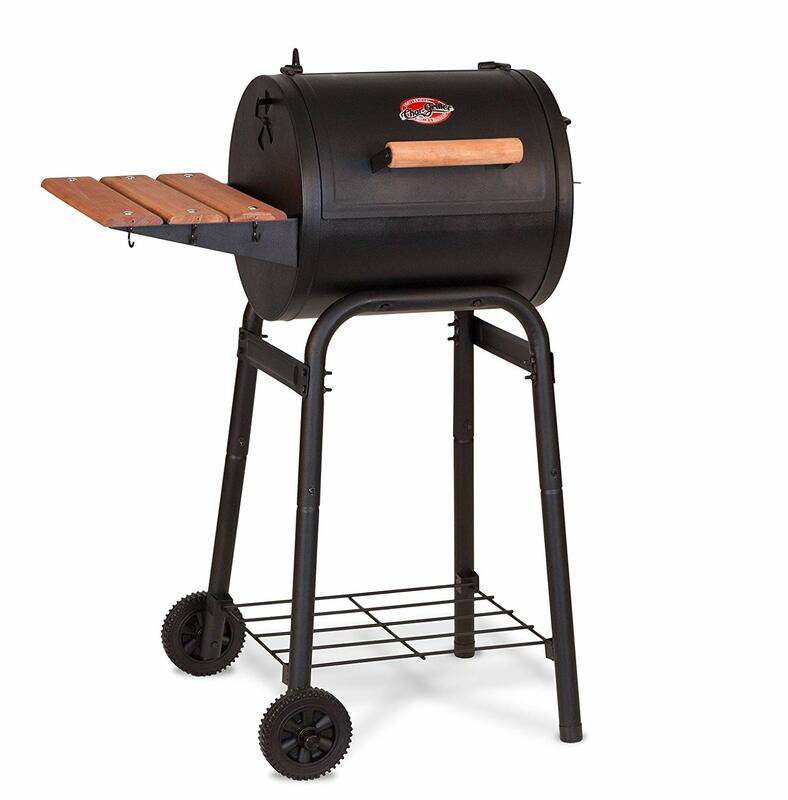 It’s made of sturdy heavy duty steel with powder coating, with grates made of cast iron, a bonus side-shelf, dual dampers, temperature gauge, and ash pan for easy dumping. It’s perfect for beginners who want to experience their own backyard barbecue, and is great for camping parties, too. Priced under 100USD, it’s a very affordable and cost-effective charcoal grill. This grill is nice and light, as it is made of steel, so it is our favourite pick to carry around. Although it is still you do lack some cooking space, overall it is a cheap and fab option. Check It on Amazon ($76.00) Prices are accurate as of 24 Apr 2019 at 12:19 AM . Product Prices and availability are subject to change. Any price and availability information displayed on Amazon at the time of purchase will apply to the purchase of any products. This table-top grill is one of the most portable and lightweight models from Char-Griller. Weighing just around 40 lbs, it boasts of 250 square inches of cooking space. You can easily bring it with you to tailgate parties, camping trips, picnic dates, or wherever you wish to enjoy a small barbecue party. 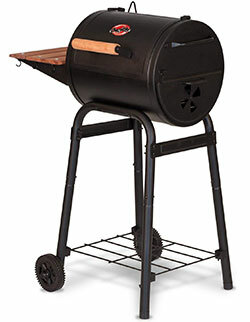 Even better, it can be used as an attachment to your existing charcoal grill from Char-Griller and use it as a smoker. It’s small, but definitely packs a punch. I consider myself an outdoor person. I like working in the garden, planting flowers and cooking outside. But let me clarify that. I like cooking over an open fire. So, deciding that a char grill was about as American as Apple pie and baseball, I set out to purchase a char griller. It did not work out too well, for I found there were hundreds of different models, types, and configurations to choose from. Going online did not help much. I went to website after website in search of the perfect Char Griller smoker Grill for me with the right buying guideline. Instead of helping clear my confusion, it only made it worse. The same style grill was different prices on different sites. The information was not really clear, or the things I was looking for wasn’t there. What I considered a priority, others did not. Just when I thought I had found the right information, my gut reaction made me take a step back, and I began to doubt my choice. I was ready to throw up my hands in surrender until I found Grills Forever. I am so thankful I did, for they had the information I was looking for! Plus, I knew I could trust them. How? You may well ask. Please read on to find out why I trusted them, and you can too. Grills Forever has been running methodical and analytical research for the past five years, therefore, they have the experience to give you accurate, up-to-date information. Their sole purpose is to help you, both our new readers and our treasured followers, to find and pick the product that is right for you. Grills Forever has put over 48 hours of online research into finding the best Char Griller Grills, and they have involved several people, including volunteers, in the project. Doing this helps eliminate any subjective or biased reviews which happen when shopping from a single source on at one single store. 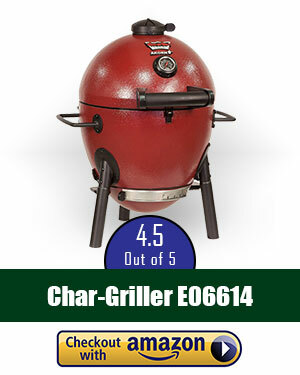 We have reviewed different brands of char grills. This is evidence that we are not biased or trying to promote any specific brand. We did this by reviewing over 15 products before shortlisting the best 15 of them. After that, we selected the top 10 brands from among them and ranked them in order. Whoever you might be, we are confident that this review will help you. No matter what your lifestyle is, no matter where you live, life is busy these days. During your leisure time, you want the best grill for you. You may be a person who lives in a small apartment who doesn’t have room for a big charcoal grill; or, perhaps you are the kind of person who wants the biggest and best char grill that money can buy. One with all the bells and whistles. One that will do all but start itself when you are on the way home from work so that it will be ready to cook your supper when you walk through the door. Then there are those who only want the basic grill. Maybe they live alone and don’t need a big fancy grill or smoker, or maybe just that their budget is a little tight. Whatever the reason or situation, we strive to give you the best information possible on all the types and styles on the market today. 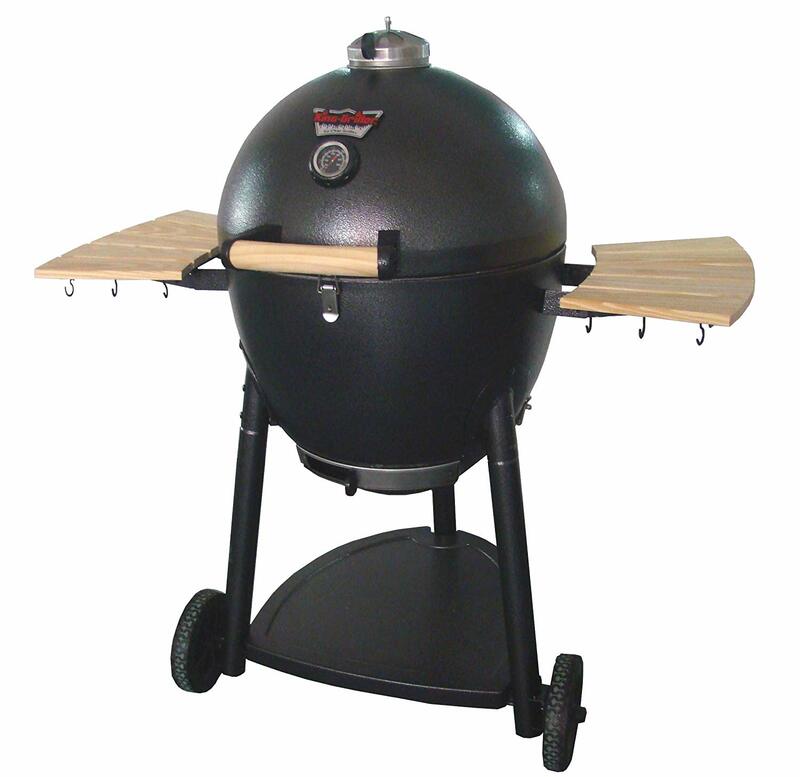 Kamado Grills- The Kamado grill is an age-old type of grill, usually oblong (like an egg) shaped. The principle behind this style of ceramic grill is that it is made from hardened clay, which works to keep both the heat and the fluids inside the meat you cook. Gas Grills—There are many types of gas grills but they all have one thing in common. They use propane gas to cook your food. Many are made of stainless steel. The higher the grade of steel, the longer it will last. Plus, the clean and sleek look of steel is a plus for many consumers. Charcoal Grills—As the name implies, this grill uses charcoal as it’s heating source. It comes in many shapes and sizes and a rack which can be lowered or raised to control the amount of heat your food receives. Some have lids, vents and other accessories. Portable Grills—All of the above grills can be made small enough and portable enough to take with you from place to place. If you have a small space, or go a picnic, for instance, you can get a kamado, gas, or charcoal grill suitable for your needs. Accessories— anything from spatulas to covers. Can come in kits or alone. BTU/ Square Inches— BTU is a measurement of the heat a grill produces. At one time it was recommended that a grill should produce 100 Btu’s per 1 inch x 1 inch. Size of the Grill— This, at one time, was used to measure the BTUs but not now according to some experts. Number of burners— some experts recommend two burners minimums so that you can cook two foods at two different temperatures. But there are many options. Materials— what the grill is made of. Stainless steel (high grade) may last longer. Warranty— depends on the manufacturer. Price— what you can afford with your budget for there are many price ranges. Durability— depends on the kind of material the grill and housing are made of. There is a wide range of materials such as stainless steel, ceramic and cast iron, for instance. 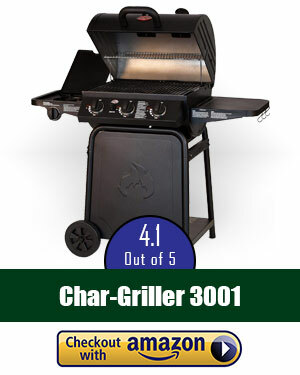 We have gone through over 4000 user reviews of Char grills to determine the important features that most users look for or need when looking for a Char Grill. We then analyzed over 20 different products. We then shortlisted 15 candidates from the products we researched, visited their websites, gone through their descriptions on different web pages and analyzed individual critical reviews to determine the features this kind of product normally has. We then done product research on char grills and analyzed the research along with a side by side comparison of their features. Our group of diverse volunteers used different models in their own homes and gave us feedback after extensive use. We compared the final reviews from our volunteers and matched them against the research data which had collected from the web. With all this data in hand, we then selected the best products and we are now ready to give you our verdict. Hang on to the edge of your lawn chairs. Here we go! When we set out to choose the winners of our Char Grills list, we looked at different types and analyzed 27 qualities a char grill can have. These qualities were picked from the summary that the products display in the manuals. The rest of the features were the ones that weren’t mentioned in the buyer’s guide but did concern the users who purchased the product. We looked for the grills which will bring the best return on investment, including the initial cost, and the cost to use, such as fuel. Then we considered all the reviews and feedback of the customers who purchased the products to determine and exclude obsolete products from the list. This is done to ensure that the users find an accurate review of the best products of 2018. Before I jump from the frying pan into the fire, let me tell you why we have chosen this as our number one pick. For each of the items our list, we will first explain the reasons why we chose that particular model as that pick. 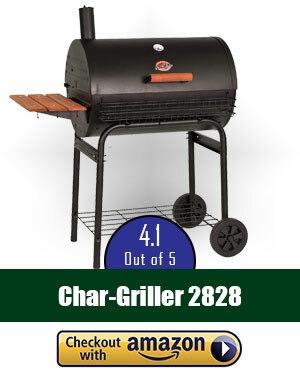 Why Is This Product the Best of All the Gas Grills Produced by Char-Griller? We have analyzed 27 features for every product we selected. The product has twelve of the features and these features are the highest among any other gas grill available on the market. 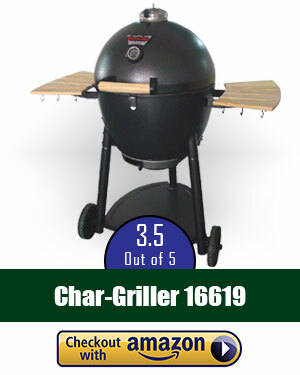 The price of the Char-Griller is around $160.00 on the day we collected the data. We feel this is a very reasonable price for all the features offered by this grill. It has a star rating of 4.1 which is the highest among the Char Grills and this product has an amazing market impact with over 700 reviews. This grill is made from stainless steel and has 40800 BTU burners. This model also has the best cost-to-feature ratio compared to any other product on the list, which makes it the best Char Gas Grill on the market. 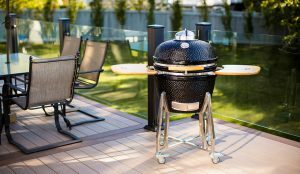 Build— 40,800 BTU with more than 430 square inches of square inches of main grilling area, steel construction porcelain-coated cast-iron grates. Measures 50″ X 25″ X 42″. This grill generates enough heat to cook for sure! 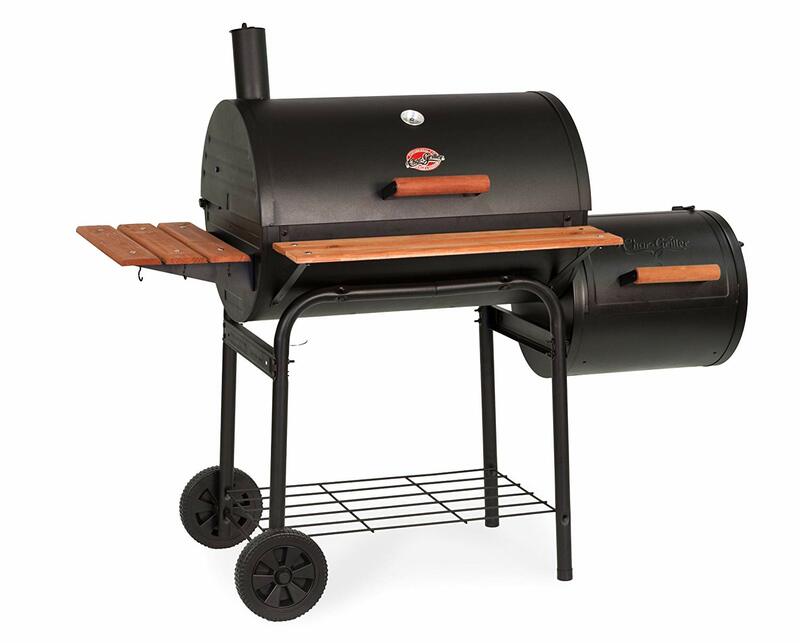 Features—warming rack, side burner, electronic ignition, side rack, utensil hooks, wood tray. Propane gas fired. Has two-wheel portability. While the gas feature may cost a little more out of pocket, it is well worth the expense for the cooking power and ease of us. Temperature and Control— heat deflector, temperature control, 643 inches of cooking space with side burner, electric igniter, knob control. This unit is very easy to use, with easy-to-read dials. It is also easy to start. Other factors—$160.00. (extra charge for assembly) 88.2 pounds, 4.1 star rating out of 5. Stay cool handles. Manufacturer warranty. Most verified purchasers report they are very satisfied with the value for price ratio and would recommend it to others. Made of steel, with a ceramic coating on the racks, this grill produces a lot of heat. It is lightweight and has two large wheels which make it easy to move from place to place. It has a side burner with a lot of heat productivity as well. There is no waiting for the grill to reach the right temperature either. The electronic starting will have you grilling in no time. It does come with a wood tray if you would rather have that wood-fired taste to your burgers and steaks. It is not equipped to use charcoal. Cook a complete meal for a group with the racks and the side burner at the same time. This is one versatile grill! Large enough to be used outside, but small enough for that patio or balcony. Not recommended for indoor use, of course, due to the danger of fumes. Powder coat paint to reduce rusting and other problems. Ceramic coated racks for even heat distribution and helps with cleaning. Comes with manufacturer’s warranty. Conditions not specified. Contact the manufacturer. If you like ease of operation, durability, and portability, this is the Char Griller for you. 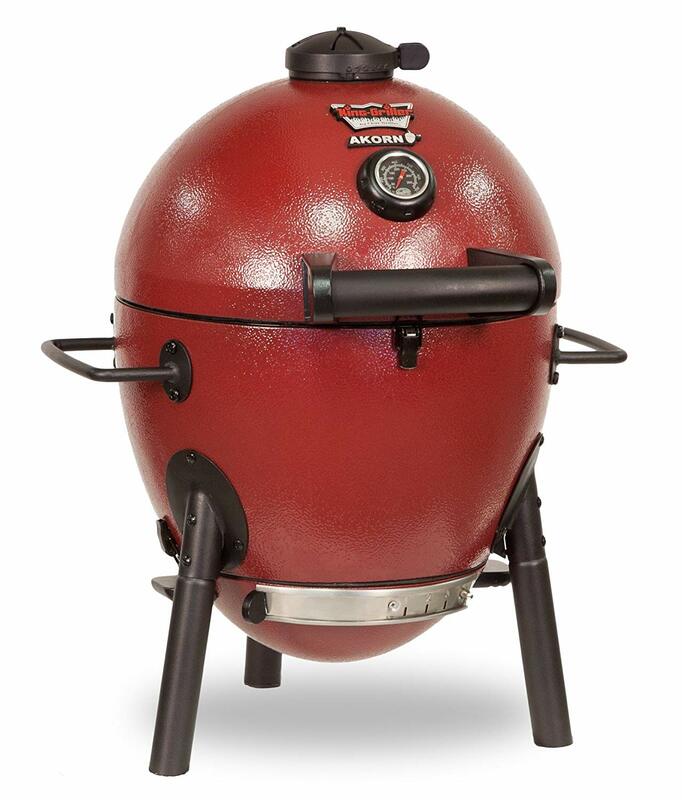 Why Is This Product the Best of All the Kamado Grills Produced by Char-Griller? We have analyzed 27 features for every product we have selected. The product has fourteen of the features we look for and has the most positive features among the kamado grills. 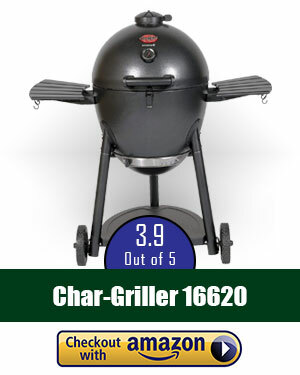 Based on the comparative feature analysis this grill lists as the top kamado grill. The price of the grill is approximately $116.00 which is the lowest among other kamado type grill. This product has the highest star rating of 4.5 out of 5 in over 200 reviews. This shows this is very responsive to the market. This product holds heat well, like most high-end ceramic versions. Grill with less fuel for great meals and saves the beating on your wallet! 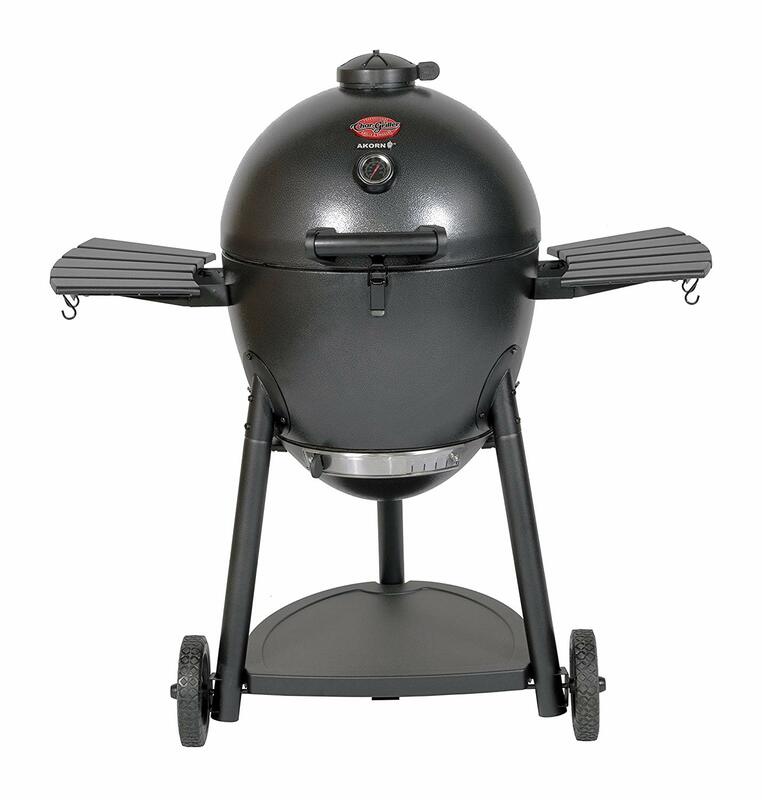 With all its combined features this product remains the best kamado grill on our list. Made of powder coated steel, this egg shaped, or oval grill is a good value for the price. It is lined in ceramic which helps to hold heat and helps also to regulate the temperature. It is a basic coal or charcoal grill, with very few bells and whistles. What amenities that are included are intended to help with ease of cleaning and portability. 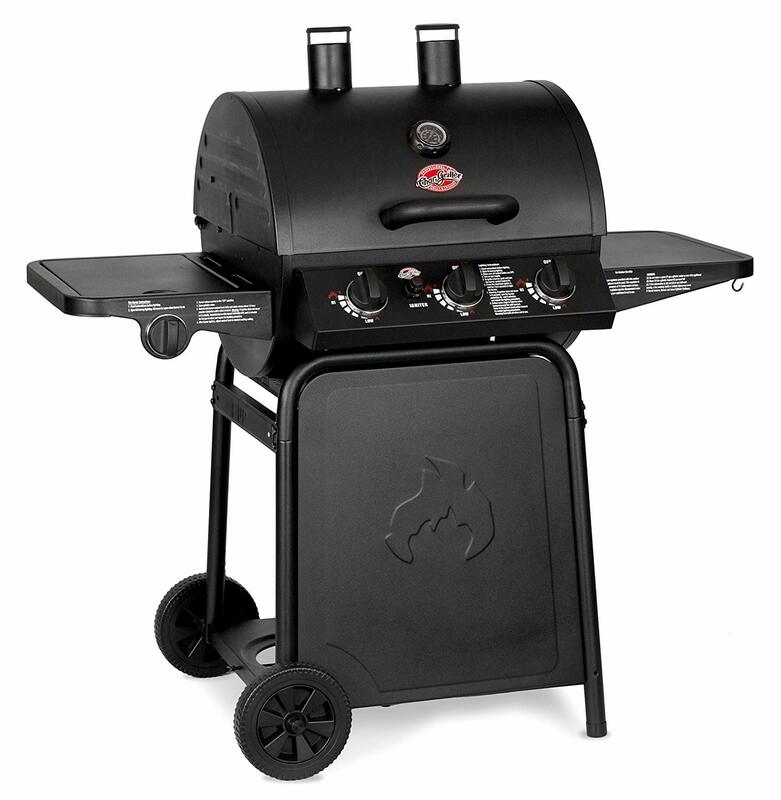 Verified users have a high opinion of this grill according to their reviews. Great grill for the novice backyard cooker. Build— has over 150 inches of cooking area. Grates made from cast iron. Handles for easy carrying. 22-gauge steel. Exterior powder coated steel in red pain. Interior is porcelain coated for even heat distribution. This grill will last for years even with frequent use. Features—easy empty ash pan for fast and easy cleaning, located outside of the grill. Weight is 37 lbs. This is a very portable grill, lightweight so you can take it anywhere. It is also easy to clean as the ashes are collected in an outside bin. Temperature and Control— air dampers on both top and bottom for precise and convenient temperature control. While this can be a little tricky, especially for the new grillers, it takes practice to know when the heat is right. Other factors— around $115.00 which is very reasonable for long years of service. 4.5-star rating. Manufacturer warranty. 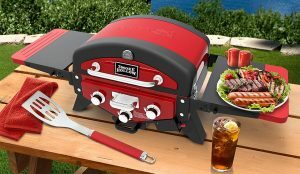 This is a very good price for those of you who want the convenience of carrying a grill to picnics or tailgate parties. If you are looking for a tailgating or picnicking grill, this is a good one for you. Also, if you are new to backyard grilling you may want to give this one a try before moving on to the more expensive brands. It is not exactly a knockoff; but built along the same lines of a more expensive brand. It can use coal or charcoal. It is not exactly high tech with its features but does have a temperature gauge. It is also well insulated, powder coated and a good value for the money. Why Is This Product the Best of All the Charcoal Grills Produced by Char-Griller? We have analyzed 27 features for every product that we have selected. The product has fifteen of these features. While this number doesn’t sound high in relation into our other products, keep in mind that those other products come with a few more bells and whistles, they also come with extremely high prices. So, based on that fact, this is our best Charcoal Char Grill. 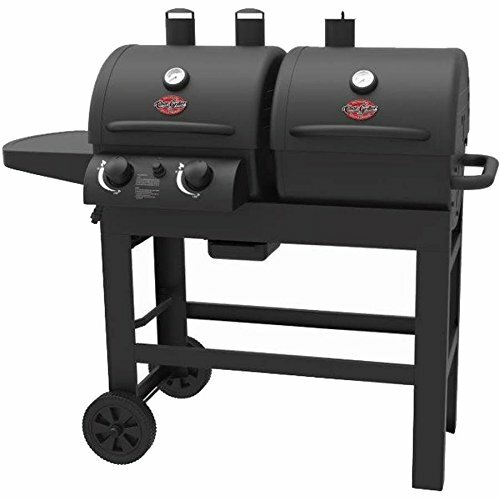 This product is priced around $85.00 on the day we collected the data and is the second lowest cost product among the char grills. This product is very promising as it has the second highest star rating of 4.3 stars with over 600 customer reviews. This grill is made of a steel constructed to withstand stress and comes with a poured iron grate. It also has 250 inches of heating space which will perfectly suit your outdoor cooking needs. So, taking all of this into account, this is the best charcoal grill when comparing the price to feature ratio. This grill is also made from powder-coated steel, for durability. It has a large cooking area for its small size. It is also light in weight which makes it easy to wheel about on its two wheels. 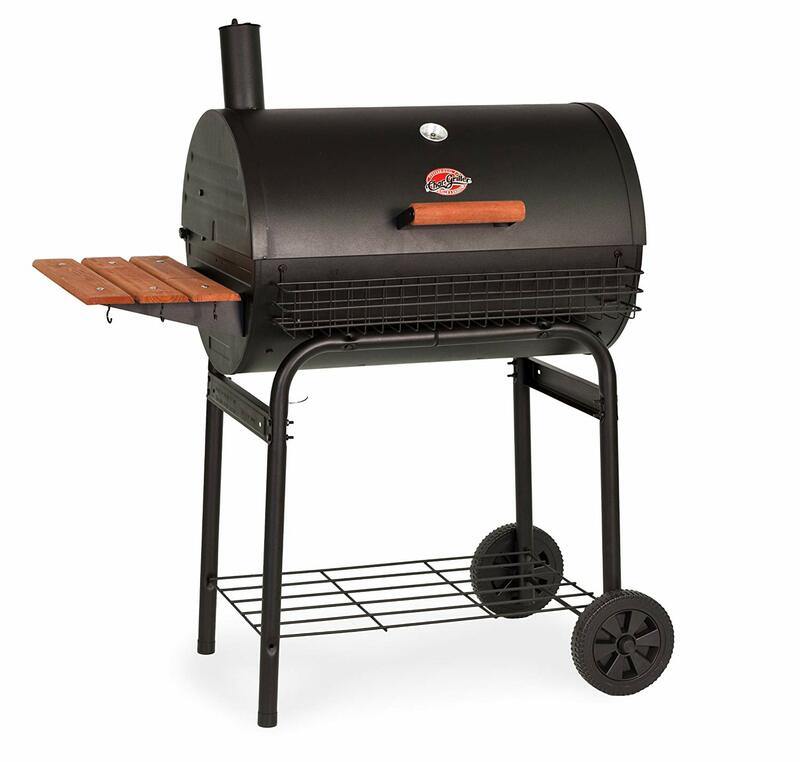 It uses charcoal for heating, so it is cheaper to operate than some other gas fired grills. The price is very good if you are a newcomer to grilling, or if you are living alone. It’s portable enough to take it for tailgating or to a picnic away from home. Build— heavy duty steel with powder coat. Cast Iron Grill. Weight 50 pounds. Has two rolling wheels for easy movement. A very sturdy grill that will last a long time. Steel is rust resistant and the powder coat paint will also keep it from rusting. Features—Compact for small spaces. 31X21 and only 44 inches tall. Uses charcoal. Easy dump ash pan makes clean up quick and easy. Side shelf for storage of plates and other grilling accessories when not in use. The sided shelf is a plus since you may not be near a place to store items that you need close to hand. Temperature and Control— has vent, hinged lid, heat gauge. Temperature is controlled by the amount of air in and out of vents. The handy heat gauge tells you the temperature inside without having to raise the lid. Other factors—$86.00 dollars (requires assembly). Reviews by verified purchasers are 4.3 stars. Manufacturer warranty. You can have this grill assembled but it will cost extra. If you are handy with tools, this should not be a problem. Some consumer state the assembly instructions are confusing and useless. Some wobbly in legs after assembly, which could be a safety issue. You get what you pay for with this grill. It is durable, compact, and has a long life according to verified users. There are a few issues, such as it tends to wobble on its legs if not installed properly. It does come in pieces and some users report difficulty with following the instructions to put it together. But, if you live in a small apartment or camp, this would be a handy grill to have around. It is very cost efficient with the cost of the grill being low. There is also the convenience of using charcoal so that you do not have to go out to refill tanks often. A good choice for the novice griller as well. Why is This Product Our Portable Pick? This is a portable grill which will make your meals marvelous. It is lightweight, so It is easily transported to the places you go and want to add grilling to your list of activities. Whether going to a football game, tailgate party, campsite, or on vacation. If you are looking for the most lightweight grill on the market, this is it. It has a rating of 4.2 stars which is just about average when comparing it to other products on our review list. This size of this grill is compact and small, so the cooking grid space is not as big as some of our other products. On the other hand, being this size is what makes it so easy to move around. The main reason this grill for this grill’s ranking on our list is the cost-to-feature ratio, which is very good. The price of the product is approximated $65.00. For beginner grillers, this is a suitable choice. When we compare with our other differences we can see the difference in the size of the cooking grid and temperature range. Having the lowest price and other extraordinary features make it very affordable. You can carry it anywhere you like as the weight, when compared to other grills, is very low. Apart from these slight differences, this machine takes the best spot for both affordability and portability. Build— cooking space: 250 square inches. 8.5″ x 17″ x 16″ (40lbs). The grid is cast Iron. Very portable due to light weigh. This is a tough little grill which is also very mobile. You can take it too picnics or other outside activities with ease. Features—has external ash catcher, uses charcoal. 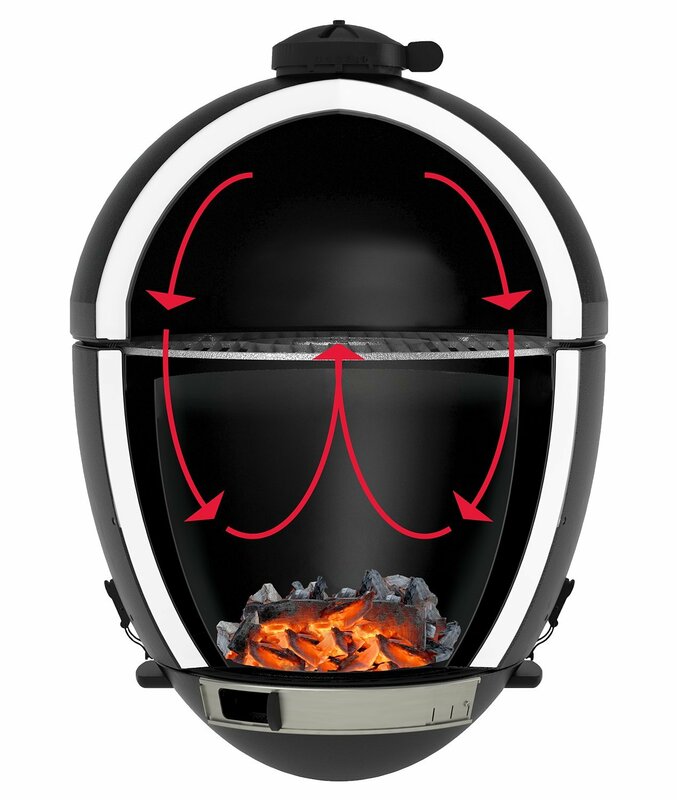 Has an additional attachment which can turn the unit into a char grill smoker. 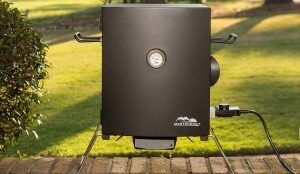 This char griller smoker box is a must have if you like the flavor of apple wood, or hickory added to your meats or vegetables during cooking. Temperature and Control— Vents and attached lid. There is no mention of embedded gauges for temperature control; but, with a keen eye, you can manage the heat with no problems. No warranty mentioned in the data. Uses charcoal. Other factors—Has sliding ash catcher for ease of using and cleaning. 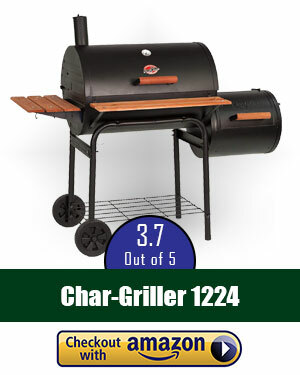 This is a good char grill for beginners to learn how to cook in the great outdoors or on the patio. Has attachments (optional) for smoker. This unit is small and lightweight. It is easy to pack and carry just about anywhere you want to take it. The cost is low when compared to other models on our list. It seems that verified users either loved the grill or hated it. However, the positive reviews outnumbered the negative ones. The main complaints were: parts were missing or fit together poorly. The paint either peeled or burned off, and the difficulty of some users while trying to adjust the cooking temperature were other issues. There are some comments about the warranty, which most users relate to the manufacture not wanting to provide parts that were left out at shipping. 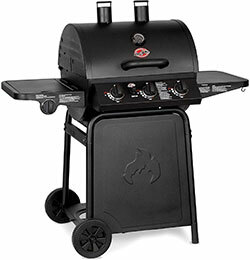 However, if you are looking for a cheap (in comparison to other models) grill, that is lightweight, this is the grill for you. It is also good for beginners to learn how to use a grill, for it is both affordable and can be replaced later as your skills improve. As always, a lot depends on what features you are looking for in a grill. This little machine does it job, but it does require some forethought, such as treating the pain with oil before its first use. This grill looks good, but does have some issues. There have been problems with the warranty for many customers. However, the grill is good, coming with a warming tray and extra insulation, so don’t be completely put off. This little grill has 314 inches of rack room. It also includes a warming rack of 133 inches. This totals up to a total usable space of 447 inches. It is made from cast iron for the body, but it is also insulated to help retain heat. This is cost efficient since you will use less charcoal for cooking. It is powder coated black to prevent peeling or chipping and the inside is porcelain covered in steel. 26.6 x 24.8 x 21.65 in, weight is 98 lbs. Has a good-sized warming tray. Cast Iron body with steel tubes for legs. Has rubber wheels. This grill is a bit heavier than some of the others we have discussed so far, but it does have char grill smoker option. Weight 98 pounds, egg-shaped grill. Has two rubber wheels for rolling. Uses charcoal but can be used as a smoker. Again, the smoker is an added plus. 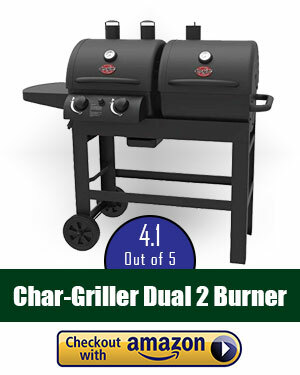 If you are looking for a char grill smoker and a char grill, this two-in-one would be a good choice. Uses damper for heat control and has a temperature gauge. The embedded temperature gauge is a plus. It lets you see the actual temperature inside the char grill smoker. Smoking uses less heat versus regular grilling. $299.00. Has hinged lid. Manufacturer warranty. The attached hinged lid is a plus since you do not have to worry about having to find a place to keep it safely away from children or pets when the grill is hot. Insulated to decrease fuel cost. Many of the negative comments from verified users relate to the manufacturer warranty. Some issues were due to receiving a dented grill, which the manufacturer refused to replace because it was not their fault but rather shipping. Most users enjoy using the grill. They liked the size of the grill and once they learned how to monitor and use the dampers they were satisfied. So, for the money, this grill is a good deal. There are many reports of having the grill in use for several years. It is portable, energy efficient and can be used for smoking purposes. It is a good all-around grill/smoker unit. If this is what you are looking for, you can’t go wrong with this one! This grill is made for longevity. It cooks really well and is built to last a long time. Annoyingly it does come unassembled, but it has a tonne of cooking room which is excellent. This portable grill has over 825 inches of cooking room. It is made from steel and has been painted with powder coat for a durable, long-lasting finish even when using high heat. The racks are made of cast iron as well, so it is built to last. The temperature is controlled with dampers, but you monitor the heat by using a gauge on the hood of the unit. Built with a shelf to the side, there is plenty of room for your grilling accessories all within easy reach. It has an ash pan that makes it easy to dump the ashes and keep the unit clean. 42″ x 29″ x 50″ (100lbs) Has both a cooking and warming tray. Made from steel. Racks are cast iron. Built-in dampers and gauges to help with temperature corrections are a plus when grilling. So is the handy shelf to store things that you may need like spatulas and plates. This has a barrel-like construction. Uses Charcoal as fuel. Adjustable grates. The adjustable grates allow you to raise or lower the food so that flair ups maybe avoided. A barrel type construction also allows for larger foods to be placed on the racks. Uses damper for heat control. Heat gauge on top. The heat gauge is a plus for those slow cook meals which need to be kept within a certain temperature range. Cost $115.00. 4.0 stars out of 5. Manufacturer warranty. Keep in mind that this model needs rubbing down with cooking oil or some grease prior to the first cooking. This is called ‘seasoning’ and helps to prevent rusting. This is a work horse of a grill. Its barrel construction is durable and gives more cooking room. The temperature of the cooking process is controlled by dampers, but it does have a gauge on top to help keep your meal on track. It is great for apartments or balcony living and many report years of use. The price of $115.00 is very reasonable for this type of grill. Most verified users are very happy with their grills. If you are looking for a grill which requires little maintenance and can last for years, this is the one for you! This is a more expensive grill, but then it does offer some professional grade features, although some customers do dispute these claims. Overall, it is probably a good grill to choose when it goes on sale. This grill is a professional grade cooker that has many features of other models which cost much more. It is flexible in its uses due to its large grilling space, and the handy side fire box. The side box can be used as a smoker or grill which will give you more space. It has cast iron construction and an ash pan which can be adjusted to help control the heat and also dump the ashes. It also has a double bottom, which is where most grills tend to burn through or rust, making you how to prevent grill rust. A built-in heat gauge is the ticket to make sure your food is cooked to perfection. Double bottom construction, 62″ X 29″ X 50″, weight: 146 lbs., Cast iron grates. This is a heavy weight grill—literally. It is by the far the heaviest we have looked at so far, yet it is portable. The built-in heat gauge lets you watch the temperature without lifting the lid. Barrel style, 146 pounds, rolls on two rubber wheels, uses charcoal for fuel. 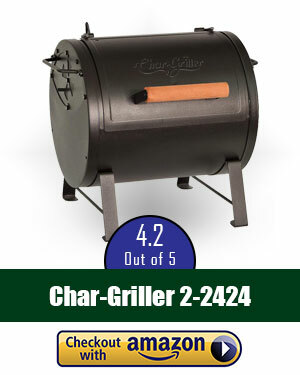 If you prefer charcoal, this is a great barrel style grill. The airtight hood not only regulates air flow, it keeps the heat from escaping as well. Hinged lid, dampers, built-in temperature gauge. Airtight flanged hood. Built-in temperature gauges are a plus with any grill. You can see the temperature inside without having to lift the lid. Around $200.00 (unassembled). 4 star out of 5 rating. Manufacturer’s warranty. You can have the grill assembled prior to shipping, but there will be an additional charge. Advertised as a professional-grade char grill. Also has char grill smoker box. Unassembled price of under $200.00. Some verified users are not happy with claims of professional grade. Complaints of paint peeling or chipping with first use. 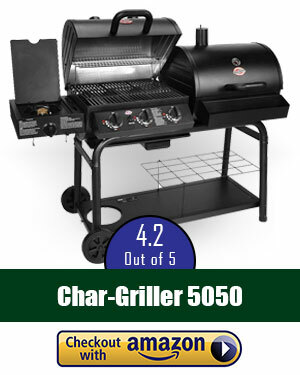 This griller is a little pricier than some of the units we have reviewed. At the time of data collection, it was on sale and that is the price we used. Most verified users like the way the griller cooks but have complaints as to how the paint peels or flakes off. It is a versatile grill and also comes with an added-on fire box for extra space. If you are looking for a grill which works well, has multi-functions and is portable this is a good one. This grill is firstly one of our most expensive options, but you do get a lot for the price, as you can use it with gas and charcoal, so two grills in one. Plus the cooking space is huge! This grill is one of the most expensive on our list. At $500.00, it is like getting two grills in one. This char griller duo is versatile in the extreme! It has the capability of using both types of fuel. It also has almost 1300 inches of food preparation area. 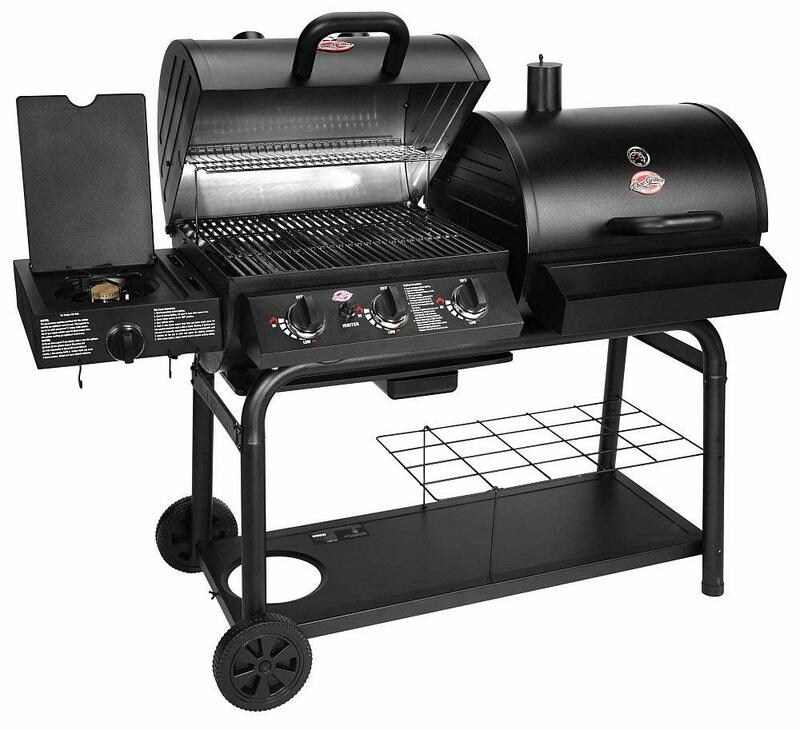 It has the capability of 40,800 BTU of a gas grill with electric starter and 3 burner eyes, plus a BTU of 12,000 burner on the side. 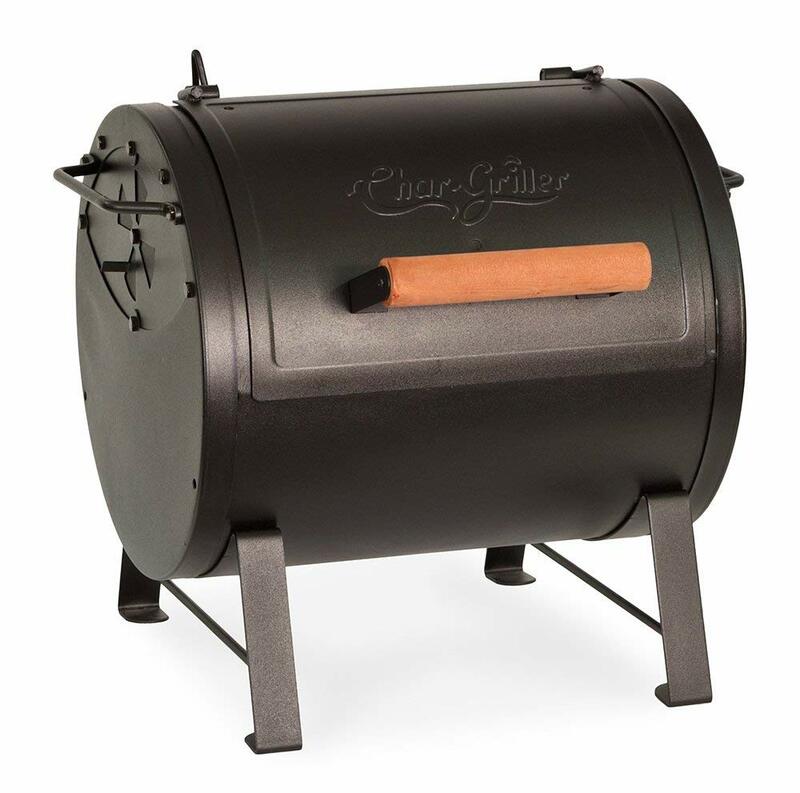 If you are looking for a char griller side box, this is it. Another plus is the grate height which is adjustable and a chrome-plated rack which can be used for warming. 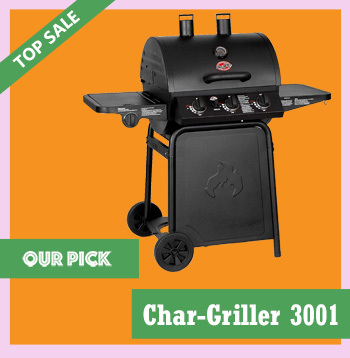 This is a big griller, so it would best be used in the backyard and is not very portable. Measures around 60″ X 25″ X 50″, Gas for fast cooking – Charcoal to tantalize your taste buds, porcelain-coated cast-iron grates; easy-to-empty ash pan. Weight 160 pounds. If you are looking for portable, fast cooking, this is a good choice for you. Dual primary cooking surfaces – use gas or charcoal- racks to keep food at the right temperature, over 1,200 square inches of cooking area. Has a side add-on burner for pan cooking. This char grill duo can cook a full meal, with different types of heat, all at one time. Stainless-steel heat gauge; cast iron grates covered in porcelain; easy-dump ash pan. Electric ignitor. Convenience at your fingertips with the electric ignitor because you do not have to worry about lighting the fires the old-fashioned way. $500.00, 4.2-star rating out of five. Manufacturer warranty. While this is one of the more expensive models on our list, it comes with a lot of bells and whistles that makes grilling life easier. It is also impressive in its build and functions. Some verified users did not receive the model as advertised. Although pricey this is a convenient grill. This char grill duo is worth the money! You can use two fuels and it is big! It has many features that other models do not offer. It also puts out a lot of heat, has 3 burner eyes to cook side dishes. If you are looking for a Char Grill due to impress and to cook a full meal for a large number of people, this is the one for you! This grill is another two in one, that can use both gas and charcoal. Again, it has a big cooking area, and the gas side will help you to cook your food really quickly if you need. Here is another Char Griller duo griller on our list. If you are looking for versatility while grilling this is the one for you. You can use either charcoal and/or gas. It has a 2-burner grill with over 850 inches of grilling and/or smoking space. It has many features, such as stainless-steel heat gauges, grates made of cast iron and an easy empty ash pan. There is an on-side burner for frying pans or skillets. 56.3 x 21 x 43.9 in. Made from cast iron. Has easy empty ash pan. Has add-ons available but at this price, you could well afford them. The stainless-steel heat gauges will not rust, nor will they be overly affected by the heat from inside the grill. 2 burner grill, stainless steel gauge, double bottom on charcoal side. Electric ignition on gas side. The double bottom on the charcoal side will keep the grill from burning through from the high heat of the charcoal fire. Attached dual lids which work independently, stainless steel heat gauges. Electric igniter on the gas side only. Two lids make this char griller duo allows you to keep the heat in one side while opening the other to check your food! $235.00. 4.5 stars out of 5 on amazon.com. Manufacture warranty. Has a high satisfaction rating on Amazon.com with many verified users stating they would buy again or recommend it to friends and family. This grill would work great if you are crunched for time because the propane gas side cooks supper quick. If you have more time, the charcoal option is also good for slow cooking. You can cook an entire meal, including side dishes, at one time. This unit is sturdy and has a high ranking among verified users. While this model is a little more complicated to use, first-time users have reported few difficulties. The cost is good since it is almost half as expensive as the previous model. large enough space you could cook a complete meal for a large number of people in no time at all. This grill is last on our list, as you don’t get a whole lot for the higher price. Customers reported various problems with this grill, so you don’t get great value for the cost. This style of cooking came from ancient civilizations, such as the Romans, who used large clay ovens build in a dome-like shape to keep the heat in. Kamados of today are made of ceramics over some hard metal, such as steel or cast iron. This model is an oblong shape, or egg shaped, grill. It can be used to cook anything, even pizza! It is durable, portable, and affordable for those who want to try to learn how to grill, or for those that live in small apartments with balconies or patios. 47.4″ H x 31.3″ W x 45.2″ L . Uses charcoal as a fuel source. The cooking area is 306 inches and has a warming tray. Egg shape let you cook different sizes of food all at the same time. Portable on two rubber wheels, so you can wheel it anywhere. weight is 90 pounds, and it is an oval shaped cooker with an attached lid. It is portable on rubber wheels. Uses Charcoal. Insulated, locking lid, two folding wood shelves. The shelves are nice since you never seem to have enough hands to hold everything when you are grilling. Round gauge in hood. Uses dampers to control heat. The gauge is good because it displays numbers rather having to read a thermometer, which can be difficult to do. The dampers control the temperature by the amount of air in and out of the cooker. $890.00. 3.7-star rating out of five. It currently has 149 customer reviews. Manufacture warranty. This is indeed a very pricy char griller. It does have many accessories that make it worth the money, such as the folding shelves, and the portability factors. This grill will last a long time. Has easy clean ash bin. This is a high-cost item with a low review value. Most of the complaints center around rusting issues of the grates after a year of use. Verified users also report that the unit maybe unsteady when its full. However, many users did like the way it cooked. It can take high heat and cook foods seared on the outside and rare on the inside. It is portable, weighing only 90 pounds. If you want to try an egg-shaped cooker this one may be the one for you. Grills and cookers, in some from or other, has been around since mankind learned to use fire. Wood was perhaps the first fuel used; but, as man progressed, so did the art of grilling or cooking outside. There are even grills on the market today which can be used inside as stand-alone units or on the stove top. These units make it easy to grill no matter the weather, space you may have, or your budget. It is also healthier in some respects since it helps to decrease the amount of fat in your diet as well. As consumers, we are obligated to look at several different features when we are shopping for a grill. What type of fuel do you want to use? Gas? Wood? Charcoal? Are you looking for a smoker? What kind of accessories and add-ons are you looking for? How much do you want to spend? How experienced are you at grilling? So many questions! I’m sure there are more that you can think of as well. As we discussed in the beginning, I was a dyed in the wool fire cooker, but at this point in my life, I was ready to change to a grill. I was overcome by all the information out there; but, Grills Forever came to my rescue. Today, we have looked at The Best Char Griller Grills of 2018. We have gathered all the data, done the research and comparison for you and justified the positive features for each model. Grills Forever has given you all the information you need in one place! I had already looked at different web pages, but all of these were designed to sell me something. Just when I thought I found the right Char Grill for my own use; my instincts would kick in and I began to doubt myself. But with all the information I found here, I was confident that the research had been done, and done correctly. I hope that this helps you as much as it has helped me when deciding which Char Grill to purchase! It saved me time and money! Grills Forever is the best!